Released from my medical treatment which had kept me in London, I immediately flew to Portugal for a silent retreat to explore the question mentioned in my blog no 1 (Ten reasons to be positive), namely the perennial one of who is it who dies? But before that can be answered, one must establish clearly who is it who lives. 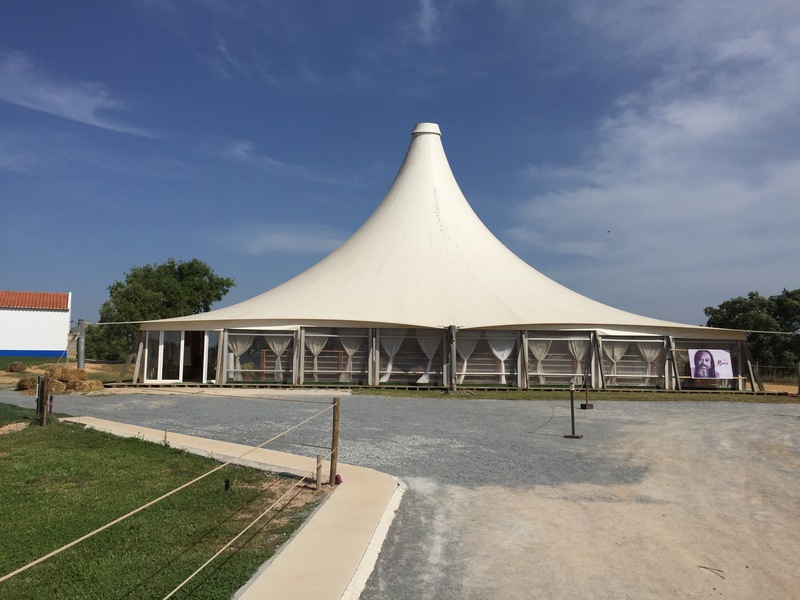 The retreat was held in the hot dry region of Alentejo, two hours south of Lisbon in a large eco village with a 200m pool and organised with comfortable cabins around the central reception area. Just as well the place was well organised as there 800 people who had travelled from all over the world to address this issue. In essence the purpose of this retreat was to experience one’s true nature hidden behind one’s usual personal identity or sense of personal self. While the philosophical method offered was the Indian tradition of Advaita Vedanta or the path of « clear seeing », a person who was familiar with silent retreats of any denomination would recognize its essential elements- no distractions, meditation, yoga and question and answer sessions with the guide. No distractions meant no speaking, no eye contact, no reading or writing. The purpose of these restrictions is to allow space for just being in the moment, allowing all negative or suppressed mind states to emerge into consciousness to be cleared away by awareness. My response to this programme was initially somewhat hostile as my egomind went into resistance. For the first few days, I was highly judgemental of my fellow participants and the guide, oscillating between irritability, boredom and even looking forward to leaving. But little by little I began to sink into the contemplative space and to listen more to what the guide was saying in the “Satsangs”- sessions of self enquiry in the form of dialogue between participants and the guide. On the fourth day spontaneously tears began to be flow periodically, what I call “meltings” so gentle that they were very discreet and I realised that there was some mysterious process at work where I felt myself marinating in a very gentle and loving energy field. It was like the earlier agitation of the mind was anticipating this very quiet descent into the heart. By the end of the retreat I felt much quieter, more spacious in the silence and grateful to everyone who had organised the event and looked forward to repeating the experience at some future date. I cannot say that I have experientially answered the question that drove me to this retreat but I have had more than a few clues and glimpses. It’s a long road ahead but the journey to the freedom and liberation and yes joy, encapsulated in the answer to the question who lives motivates me to go forward.